The piece in question features Jennifer Wilbanks and how "easy" (her word to Katie Couric) it was for her to cast a Hispanic man and white woman as armed kidnappers and sexual predators. Her "story" placed Latino men (an already oppressed group) and their white women companions (women - another marginalized group) in harms way (see Emmit Till, Rosewood, Florida, and Susan Smith). Our piece questions how our society continues to readily accept the mythical stereotype that men of color are oversexed, dangerous, violent, and strictly interested in miscegenation. The Quinlan's decision to pull the work silenced the interaction and dissemination of these ideas based on our real experiences, re-marginalizing the marginalized. But racism is not solely a Latino issue; all of us are responsible in identifying and eradicating it, and it is an issue that taints all that refuse its existence and/or choose to silence the messengers. Racism diminishes everyone's humanity, perpetrator and victim alike - although the victim loses much more. To deny the presence (within the context of the Quinlan's exhibit) of the effects of racism towards the Latino community within the confines of the U.S. borders is to ask us to betray our own real life experiences of racism in the US, to be ignorant of our history as a nation and to be irresponsible as an institution that is also about education - which was one of the main points of the exhibition. For more information, contact Bill Fisher or Richard Lou. Genevieve Kelly knows extreme. The Vancouver-based illustrator and designer pours days and days of love into each corset and shirt that she makes. Each shirt is double layered with stenciling, spray painting, embroidery or beading around a cut out pattern, revealing a second contrasting pattern. Each of her shirts constitute a unique work of art (as well as an act of obsession) Who would have guessed that a corset could set you free! I'm no more traumatized by my childhood than the rest of the world...but I bear a few scars that I like to remind my mother about when I need to twist the knife a little bit...like all of the times when I had to get a shot at the doctors and they gave me a balloon...but my mother made me give the balloon to my sister, saying "You already got something (the shot, natch), so your sister gets something too. Then there was the time when she was baking cookies during the summer, and put the OVEN RACK on the RUG IN THE DOORWAY to cool. Of course I came running through (shoeless, of course) and grilled my feet on the oven rack. There were actually little Burger King flame-broiled lines burned into my feet. Ahem. 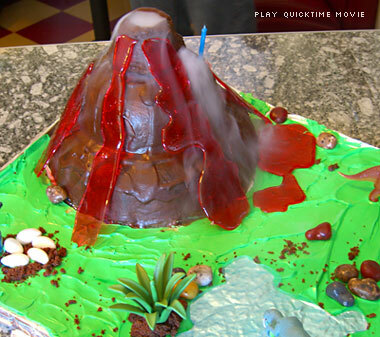 Maybe my mother could have erased all of this bitterness if she had been remotely as cool as the person who made this how-to article on building a volcano cake THAT ACTUALLY SMOKES AND ERUPTS! Some bundt cake pans, Karo syrup, and a little dry ice are all you need to ensure absolute love and devotion from your child for all eternity. I apologize for not posting much geekcraft lately...I've been mired in Folksville, but no more! THIS LITTLE NUMBER stirred me from my slumber, though. Flickr user Armchair Messiah has been busy knitting sweaters and iPod covers with the classic Happy/Sad Mac icon. For the price of the yarn and his time, he will knit one for you, too! I predict that somebody has just stumbled onto a new cottage industry. Get yours today! Clint Griffin was another happy discovery at Folk Fest. He scours dumpsters and thrift stores for discarded paintings and drawings, then collages them with each other and connects the dots with his own painting. The paintings presented layer upon layer of information and wit. Sight gags were mixed together with pathos, which was amplified by the naiveté of the paintings. He's a busy man, with representation at galleries across the country. He shows at folk galleries and events like Folkfest, which works somehow. The guilelessness of the original paintings really shines through, but when he is working with his unwitting collaborators, his eyebrow is permanently arched. RACE (Enter Personal Politics) just opened at the Athens Institute for Contemporary Art in Athens, GA. Curated by Drék Davis, the show strikes a perfect balance of savage wit and poignant social commentary. Interestingly, one of the pieces in the show is caught up in a shitstorm of controversy. "Missing Stereotypes" by Richard Lou and Bill Fisher was slated to be shown in Gainesville, GA at the Quinlan Visual Arts Center, but was censored by the board. When the artist protested their decisions, all of his pieces were removed from the show, which focused on Hispanic artists. The piece depicted Runaway Bride Jennifer Wilbanks in between pictures of Lucille Balland Desi Arnez, which comments on Wilbanks' claim that she was abducted and sexually assaulted by a hispanic male and a white woman. 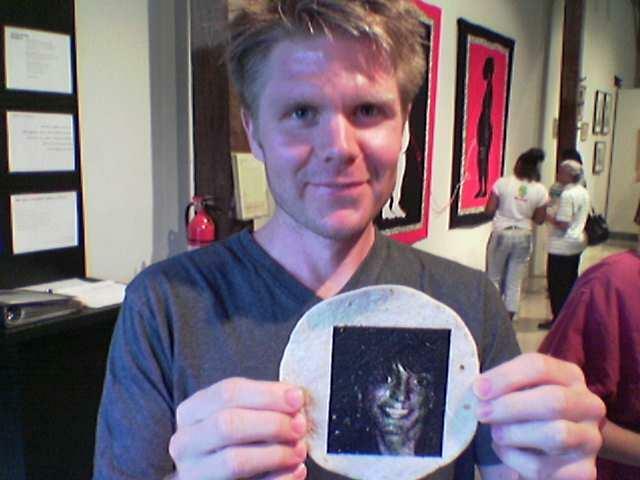 Lou and Fisher distributed tortillas silkscreened with images of the Runaway Bride at the show. The artists are hopping mad. The story received coverage by national radio and the Associated Press, and the duo are planning protests at the gallery in Gainesville. If you would like more information, please contact Richard Lou. Richard Lou also exhibited three large scale photos of himself and Robert Sanchez as Hispanic Anthropologists discovering and capturing a white suburban couple foraging in the woods. Please check out the exhibition, which is up through October 23rd. I still haven't exhausted my discoveries from Folk Fest. I was completely surprised to see the folks from Rare Visions and Roadside Revelations, a PBS series that is produced in Kansas City. Search your local PBS listings to see if it's playing in your area. If it's not, you can order DVDs of the episodes. For the last ten years, Randy, Mike, and the intrepid Don the Cameraman have been braving the highways and byways of America in their minivan, pursuing the country's most unique visionary artists. After seeing my first episode of the show, I made this post about the headquarters of Longaberger Baskets in Newark, Ohio. So far, they've covered thirty states, which is well documented in, what I can only describe as THE BEST JUSTIFICATION FOR THE INTERNET SO FAR: Their interactive FLASH map of the United States. You can scour the visionary artists in your area, get directions, and even find out which episode they appeared in. When I checked my hometown (of Lincoln, NE) I found a Vietnamese artist who makes gigantic sculptures out of car bumpers. There are too many artists to list around Athens and Atlanta. The Southeast episode is being edited even as I type this. I forgot to mention that they have a book, too! It contains many of the tasty visionaries from the TV show. Do you live in the Northeast or Western United States? You'd better start lobbying them for the inclusion of your favorite weirdities. Oh....their mascot is the world's largest ball of 3/4" videotape. Boo Ya! I'm still working on putting up some posts from the Atlanta FolkFest. The freshest breath of freshest air among all of the fakefolk and jaded dealers was Sean Samoheyl, an artist from Virginia. For once, here was an artist at a major show who wasn't taking a single schtick and driving it into the ground. Sean seems like the best case scenario for an artist--creative certainly--creativity dripped from his carved, crocheted, and assembled fiber objects, but Sean is also very curious. As strange as it seems, It's rare for me to find artists who are genuinely curious about exploring new things and filtering them through their own worldview. Perhaps somewhat quixotically, Sean was staging puppet shows at his booth in the middle of the festival. Not many stuffy old ladies in search of Boo Radley-produced art stopped to watch, but those who did got to see a rare treat. 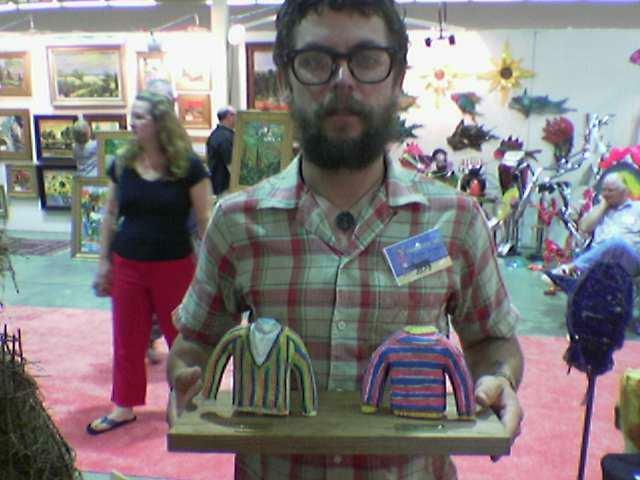 In the photo above, Sean is posing with a very charming carved sculpture of two sweaters...Ernie and Bert's. Catch phrases from Sesame street are stamped into the wood base. Sigh. So check out his new WEBSITE, and cross your fingers that you run into his work in the real world. Yesterday, I made the claim that Danny Hoskinson, better known as "The Bucketman" is America's greatest living folk artist. I stand by that claim, and hope that it will cause all of you to investigate further. 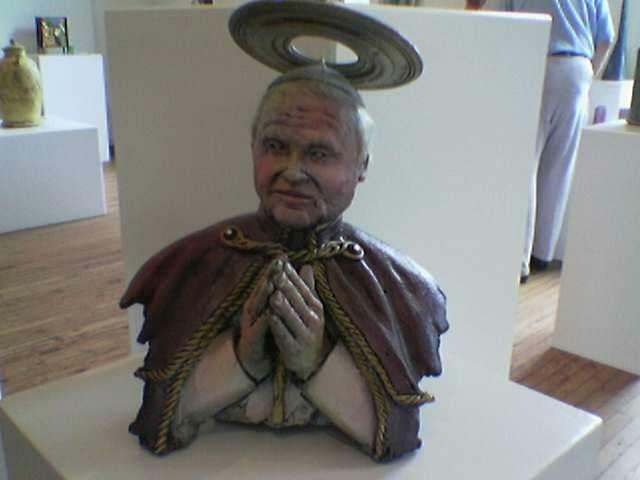 "Folk art" is a slippery slope--filled with exploitation, condescension...and lots of bad bad art. Danny Hoskinson embodies all of the good things about folk art. He has a keen ear for stories--both contemporary and traditional, and tells a story with each of his objects. In the five years since I encountered his art, he has won considerably more recognition, and it doesn't seem to have affected him in the least. Danny lives in East Tennessee, along the Ocoee river, and has filled his world with all of the creatures that his imagination can squeeze out. The piece that I own was created after he saw Tim Burton's remake of Planet of the Apes. It consists of an overturned 5-gallon bucket that has been sculpted into an ape head. There is a separate piece--a statue of liberty monkey hand holding a torch with a votive candle holder. Danny knows how to add special touches to each piece--like the candleholder...and the Lee Press-on nails that he added to the fingers. He doesn't shy away from mingling the contemporary with the mythical and historical, his art simply creates its own world. I love that the buckets are a 20th/21st century on traditions like face jugs and totem poles. Internet resources on Danny are unfortunately hard to come by--here's an article, a website from a collective he belongs to, and finally, Danny's BRAND NEW WEBSITE! It's a little thin to start out with, but I'm really glad it's there. He intends to update it faithfully. If you're ever passing through Tennessee, you can visit him at his new "Roadside Bizarre". It's located at 1618 Highway 64, 1/2 mile west of Ocoee Lake.